World oil trade is about 50% of world oil usage. 42% of world oil trade (18 mil barrel/day) from Saudia Arabia, Iraq, Kuwait, and Iran passes through the relatively narrow (30 miles wide) Straits of Hormuz. Bottom line --- As of 2007 we are 'burning through' (as one wag put it) 18% of our corn crop (& doubling corn prices) to achieve 1.4% of our oil needs. In 1973 President Richard Nixon created Project Independence, which set a national goal that, within seven years (1980), the United States would develop “the potential to meet our own energy needs without depending on any foreign energy sources.” And I remember Jimmy Carter in an address from the white house looking into the TV cameras and pledging that in the future the per cent of oil the US imports was going to decline. Pickens said every president since Richard Nixon has said, "Vote for me, and we'll be energy independent." "Nobody ever did anything", he said, noting that we've actually become more dependent. "Nobody's ever been held accountable for those statements. ... Nothing's ever done." Where does all the ethanol go? The numbers above don't seem to add up. The ratio of ethanol/gasoline = 6.5% (=7.8 bil gal/120 bil gal), but only about 0.5% (=1,000/180,000) of gas station can even pump ethanol, and they also must be selling gasoline. So where does the ethanol go, how is it distributed? Is it used mostly in commercial truck & bus fleets? Is it possible that the accounting is suspect and that the ethanol plants are burning up a large fraction of what they make in the production process? Maybe the ethanol gas station count is just wrong. NYT and Wall steet journal report ethanol prices have dropped 30% while gasoling is still rising with spot prices up near $80/gal. Cause is not enough distribution channels to support all the refineries coming on line. Also with lower ethanol prices and much higher corn prices (70% of production cost) the profitability of ethanol production has fallen sharply. A NYT guest editorialist (Ron Minsk, 2/1/07) makes an interesting point. He says that even if the often stated energy policy goal of “eliminating the import of Middle East oil” could be achieved (and it won't be), it would not insulate America from world oil price volatility. With spare world oil capacity disappearing (oil peaking) oil price instability is growing and could become chaotic. Since there are almost no short-term substitutes for oil, oil price instabilities flow right through to production costs. "Even the use of alternative liquid fuel instead of oil-derived gasoline will not allow us to escape this volatility, because as direct substitutes for each other, gasoline and alternative fuels will be similarly priced. This means (from a price perspective) the percentage of oil we import is relatively unimportant. So while the domestic production of oil or alternative liquid fuels may be critically important for a lot of reasons, it won't do much to end (domestic) oil price fluctuations." (4/21/08) Interesting development in the oil business today -- Saudi Arabia has said for several years that their plan over the next few years was to increase production capacity to 15 mb/day. Skeptics have argued -- it's not going to happen. Guess what? Today Saudi Oil minister said the plan to increase production capacity to 15 mb/day is on indefinite hold. The planned increase in capacity will halt at 12.5 mb/day in 2009. Current Saudi oil production rate is 9.45 mb/day. (4/29/08) Opec’s president (Chakib Khelil, Algeria’s energy minister) said, 'Oil prices could hit $200 a barrel (current spot oil price is $120/barrel), and there would be little the cartel could do to help. Here is my take on increasing oil prices --- Large, steadily increasing oil prices are giving oil producing countries (as opposed to western oil companies) an incentive not to increase production, but to cut it. For example, suppose oil goes up in price, say, a modest 20% a year, then a producing country can cut production 10%/yr and still increase their country's oil revenue 10%/yr! Reducing production continues the trend of higher prices. Oil is saved for the future and the standard of living can still rise. From the producers point of view it's a sweet deal! Oil price increases and resulting production cuts, whether driven by geology or the incentive to cut production (it really doesn't matter), is still consistent with peak oil theory. Probably the counterbalancing incentive is loss of return from overseas investments due to the world being driven into recession and slow (to no) growth. It would be interesting to know the ratio of Saudi Arabia investment income to its oil revenues (9.45 mb/day x 365 day/yr x 120 dol/bar = 414 billion dollar/yr). Notice this incentive only exists for long time producers like the Saudi's with considerable investments. For newer (or corrupt) oil producing countries, like Nigeria, with little overseas investment they would be little affected by a few percent decrease in demand caused by recession. Ethanol is a "grain alcohol" produced in US mostly from corn. (In Brazil ethanol is called 'sugar alcohol'.) New corn strains are available that are optimized for ethanol. It is a colorless liquid with low toxicity that is miscible with water and easily biodegraded in the environment. It burns well in car engines raising octane levels and lowering emissions, but it's not as volatile as gasoline so it can make engines harder to start in cold weather. Ethanol production from grain, as practiced in the United States, creates four co-products: ethanol, DDGS (a high protein animal feed), carbon dioxide (purified and sold for beverage use), and heat. Producing the ethanol is relatively simple, it is a distillation process where the corn is finely ground and soaked in water with enzymes to separate the starch and convert it to sugar. The sugar is fermented into the ethanol and excess water is removed with a molecular sieve. From one bushel of corn you get 2.8 gallons of ethanol, 17 pounds of DDGS (distillers grain, a valuable animal feed product) and about 18 pounds of CO2. E85 is 85% ethanol and 15% gasoline. Sold mostly in midwest. GM has 1.5 mil vehicles on road that will run on E85. One user comments on starting issues with E85, "My new 2005 Taurus FFV has starting difficulty in the morning when using E-85. It usually takes 3 attempts at cranking before it stays running. My 2005 chevy FFV pickup starts on first try every time." Other countries produce ethanol from different sources, like sugar cane (Brazil), logging waste (Sweden), sugar beets (France) and sweet sorghum (India). Most ethanol now comes from starch/sugar in the plant material with only with limited ethanol produced from cellulosic material. Brazil is a leading ethanol producer and has replaced 40% (vs 1-2% in US) of its gasoline consumption with ethanol. A big problem with ethanol is that it can't be shipped in pipelines. WSJ 'explains' the reason why is that it mixes with water and gets diluted as it moves through the pipe. Oil pipelines let in water?? Ethanol must be shipped by truck or train, or is made locally which explains why there are ethanol plants all over the place. Oil saved by 'ethanol from corn' - "minimal"
Cellulosic ethanol --- cellulosic material not broken down my natural enzymes. b) Biotech method -- "merits genuine enthusiasm"
fermentation. Big job, but big payoff. Energy input for cellulosic ethanol will be less than for crop ethanol for two reasons:. Deutch's conclusion --- In next couple of decades we can displace 1 to 2 mil barrel of oil/day (4%-8% of current US oil usage) with cellulosic biomass ethanol, but not much more. In 2005/2006 ethanol is replacing MTBE nationally as fuel oxgyenator. Used in so-called 'reformulated' gasoline and in winter gasoline formulations. Oxgyenator is 1.4% of fuel. MTBE (methyl tertiary-butyl ether) is a chemical reaction of methanol and isobutylene. MTBE is produced in very large quantities (over 200,000 barrels per day) and is almost exclusively used as a fuel additive in motor gasoline. MTBE has been used in U.S. gasoline at low levels since 1979 to replace lead as an octane enhancer (helps prevent the engine from "knocking"). Since 1992, MTBE has been used at higher concentrations in some gasoline to fulfill the oxygenate requirements set by Congress in the 1990 Clean Air Act Amendments. Oxygen helps gasoline burn more completely, reducing harmful tailpipe emissions from motor vehicles. Unlike ethanol, MTBE can be shipped through existing pipelines. Douglas Brent, the co-chairman of Permolex, said that building (ethanol) plants closer to areas densely populated with cars was ''the future of the industry.'' ''It's pretty easy to transport corn, pretty hard to transport ethanol,'' he added. A. David Pimentel, a professor at Cornell University, published a paper in 2005 with Tad W. Patzek of the University of California, Berkeley stating that the corn-to-ethanol process powered by fossil fuels consumes 29 percent more energy than it produces. The results for switchgrass were even worse, the paper said, with a 50 percent net energy deficit. Arthur J. Ragauskas, a professor at the Georgia Institute of Technology and the co-author of a positive study about ethanol that appeared in the journal Science in January, said the nation could replace a third of its current fuel demands by focusing on cellulosic ethanol from forest products and agricultural residue. Mr. Slunecka of the Ethanol Promotion and Information Council said that Dr. Pimentel's calculations did not account for the increasing efficiency of ethanol plants and rising yields of corn per acre. An article in June 2009 Scientific American points out that the world's supply of phosphorus, a major component of fertilizer, is getting dangerously low. Of the the three elements in fertilizer, nitrogen is pulled from the air, but potassium and phosphorous are mined. There's lots of potassium around, but not so phosphorous. US is world's 2nd largest producer and 65% of our phosphorous comes from a few mines near Tampa Florida (bone valley) whose end is coming. 40% of the known world's supply of phosphorus deposits are in Morocco. When human and animal waste were used for fertilizer, phosphorus just circulated around. But now wastes and fertilizer are almost completely decoupled. The result is that phosphorus used for fertilizer all eventually ends up in the sea, some in direct run off and others thorough waste treatment, and eventually it sinks to the sea bottom where it entombed in the seabed. We can't produce food without phosphorous. We have maybe 50 to 100 year supply, but 'peak phosphorous' could happen in 30 years. On top of everything else, idiot bifuels are using huge amounts of the stuff. A June 2008 article said phosphate rock had increased in price 700% in the last 14 months. "The risk of a future phosphorus shortage blows a hole in the concept of biofuels as a 'renewable' source of energy. Ethanol is not truly renewable if an essential fundamental element is, in reality, growing more scarce." When you hear politicians spouting off about how great cellulosic ethanol is, just remember cellulosic ethanol doesn't exist (as of now) as a practical technology. Fundamental breakthroughs are needed, and they may, or may not, occur! Where is the all-electric car? -- A fully electric car required fundamental breakthroughs in battery technology and a ton of money was spent on battery research. Batteries have slowly improved, but the hoped for big breakthroughs in battery technology never happened. Cellulosic ethanol, the kind produced from nonfood plant matter, has some advantages over food-based ethanol. Because cellulosic ethanol is derived from plant waste, wood chips or wild grasses like miscanthus and switchgrass, it would not require costly cultivation; that would mean savings on labor, pesticides, fertilizers and irrigation. And it is superior to corn-derived ethanol in reducing greenhouse gas emissions. According to WSJ (6/29/06 ) a lot of work is being done to upgrade the efficiency of corn ethanol by using cellulosic methods to process more of the corn. There has been good progress in lowering cost of cellulosic enzymes and new digesting bugs are available. In last five years enzymes cost per gal of ethanol has dropped from $6 to 50 cents. A cocktail of two dozen enzymes are used! 15% more ethanol will come from using the cellulose in the hull and more gain from using stalk and leaves. Altogether it may be possible to double the amount of ethanol from corn. With gas at $3/gal and federal subsidies the corn ethanol manuf are making big bucks, 35% returns according to WSJ, so there is lots of new investment in the industry. ADM and other big players using 100m in federal dollars plan to open one or two 'hybrid' prototype plants in the next couple of years. Ethanol production is expected to increase the price of corn in 2007 by 20% (WSJ). On the downside getting fementable sugar from cellulose with a good yield is a tough problem. People have been working on the cellulose problem for many years and as much as a billion dollars has already been spent! Search phrases: 'xylose sugar' (cellulose sugar), 'zymomonas mobilis' ( improved Dupont bug ). Another alcohol, besides ethanol, that can be used as a fuel for cars is methanol, sometimes called wood alcohol. Just as ethanol mixed 85%/15% with gasoline is a fuel for cars and called E85, methanol mixed 85%/15% with gasoline is also a fuel for cars and called M85. China is already using a billion gallons of methanol for (transport) fuel. Methanol is made today from fossil fuels, but it is potentially a biofuel, because its starting raw material, 'syngas', can be obtained by heating a wide variety of organic materials including cellulose and plant waste. Syngas is primarily carbon monoxide (CO) and hydrogen (H2) mixed with some CO2 and is now commercially obtained by partially burning natural gas (and sometimes coal). Syngas with a catalyst produces methanol. Methanol's atomic makeup is very close to methane. Methane is one carbon with four hydrogen (CH4). Methanol from an atomic viewpoint is just methane with an added atom of oxygen (CH3OH). Ethanol is one oxygen added to a slightly heavier hydrocarbon than methane (C2H5OH). Methanol has some advantages. It has high octane and can be burned in cars that are cheaply 'flex fuel' designed. It could also be used in fuel cells. The claim is make that it can be shipped in pipelines, but I also read it absorbs water and isn't this why ethanol can't be shipped in pipelines?. A minor problem (in the big picture) is that methanol has only about 75% the energy content of ethanol (which is 0.67 of gasoline), so gas tanks in methanol powered cars would need to be twice the size of gasoline powered cars (for same range). The idea is to produce methanol as a transportable and storable fuel, replacing oil. It's clearly has huge advantages over hydrogen for this purpose. Interestingly there is more hydrogen in a gallon of methanol than a gallon of liquid hydrogen. The idea is to 'burn' uranium or get energy from other renewable energy sources to break apart water to first get hydrogen. Here is the cool part. The future raw materials for making methanol are hydrogen (some energy source is needed to break apart water) and CO2. CO2 is the input for making a transportable fuel! Don't sequester the CO2 from a fossil fuel power plant, capture it and make methanol from it!. (However, it seems to me that raw materials CO2 +H2 have got to be less efficient than using syngas, which is CO + H2). In the future (wild speculation here) CO2 might be pulled directly from the atmosphere to make methanol, which of course when burned would return the carbon, making the cycle carbon neutral. I'm reading a book called Earth: The Sequal that is basically a discussion of many new developing energy technologies. Its chapter on solar opens with an interesting claim, to wit, capturing solar energy with 10% efficiency on just 100 miles square in a southwest desert could potentially provide the US with all of its electricity. Is this true? A good way to think of US electricity generating capacity is to think in terms of 1 Gw (or 1,000 Mw) plant equivalents. A typical nuclear plant is in fact just about 1 Gw. Wikipedia says in 2006 the US had 103 nuclear plants with a 'nameplate' capacity of 105 Gw, which is 1.02 Gw/plant. Nuclear plants in the US, says Wikipedia, had 9.82% of nameplate electrical capacity, but provided 19.4% of the electricity, which translates to electrical usage of about 500 Gw with a peak capacity of about double that at 1,000 Gw, or 1,000 large power plant equivalents. A poster at ClimateProgress (Feb 2008) confirms this, saying "Current US generating capacity is just over 1 million MW", which is equivalent to 1,000 standard (1 Gw) plants, and online capacity is expected to increase about 10% of the next five years. Let's calculate out the book's peak and average power output of 100 miles square (10^4 sq mi) of captured solar @ 10% efficiency: Since the average number is intended as a replacement for base capacity, the implication is that some means is available (hot water and compress air are two possibilities) to store energy overnight so the daily cycle can be smoothed. While bright sunlight is 1,000 w/m^2, the average power from a solar plant is only 25w/m^2. This is based on assumptions of 10% solar cell efficiency, which yields electrical power from the cells of 100 w/m^2 when the sun is shining, but this needs to be reduced by four, to 25 w/m^2, for an assumed 6 hours of daylight (and ignoring storage losses!). Dividing 1,000 by 40 we find a 1,000 Mw plant occupies 40 square km (1,000 Mw/25 w/m^2 = 40 x 10^6 m^2 = 40 km^2 = 15.6 miles^2. Or rectangular area of about 4 miles on a side. Big, but not outrageous, this could easily be lived with. In spring 2008 I spent two week driving around the state of Arizona. Southern AZ is mostly deserts and low mountain chains. The many 'valleys' between the mountains in southern AZ are mostly flat and totally empty. While driving across these desert expanses, often 25 miles by 25 miles between town, I was doing the calculation in my head, so how many 'standard' power plants would fit in this valley? Answer about 40 (@ 10% capture)! (625 sq miles/15.4 sq miles/plant = 40.6). Of course, it would take a lot of transmission lines leaving the valley to carry the power out. I see one or two (more?) tower lines leaving a dam like Glen Canyon, which is little more than one standard plant. Developing about 20 such desert valleys would result in 800 plant equivalents (80% of the 1,000 plant equivalents we now have) replacing all the coal, oil, and gas power plants. The Mojave Solar Park plant (being build by the Israeli company Solel) when completed in 2011 will be the world's largest solar plant, is expected to put out about 550 Mw (peak?) and will occupy 9.4 sq miles in the Mojave Desert. The project will rely on 1.2 million parabolic mirrors and 317 miles of vacuum tubing to capture the desert sun’s heat and run a steam powered turbine. Since the 550 Mw rating is probably peak (storage is not yet developed and solar developers always like to use the bigger peak number) and the plant will cover nine sq miles (16 sq miles/Gw peak), when I work the capture efficiency it is only about 1/4 of the numbers calculated above. This implies the capture efficiency in terms of land area is quite low only about 1/4 x 10% = 2.5%. Of course, conserving land area at present is not that important, what is important to solar developers now is to minimize cost, and as a cost saving measure this plant is to reuse some old infrastructure that was originally built for a coal fired plant in the Mojave. Scientific American had a major article on solar power in Jan 2008. The authors argue the US aim to have installed by year 2050 3,000 Gw (peak or av?) of solar power, which at 14% efficiency they figure would cover an area of 30,000 square miles (173 miles square) in the southwest desert and should use compressed air in caverns for overnight storage. 30,000 sq miles is three times the book's area of 100 miles square and at 14% efficiency would yield 3 x 650 Gw av x (14%/10%) = 2,730 Gw av, so their 3,000 Gw value is probably average. So we get reasonable agreement the book's 650 Gw av, Wikipedia's current 500 Gw (av) usage, and Scientific American projected (av) electrical power needs for year 2050 of 3,000 Gw that provides for a 4.3% annual growth in electrical power between now and 2050. How much does a large (1 Gw) power plant cost? TVA is planning to build two 1.25 Gw nuclear plants (AP1000 'advanced passive' reactors from Westinghouse) for 3 billion each, equivalent to 2.4 billion per standard (1 Gw) plant. Working some numbers we can estimate that the capital invested in the present 1,000 large US plants is roughly 2.4 x 10^9/plant x 10^3 plants = 2.4 x 10^12 dollars (2.4 trillion dollars). So if a similar investment went to, say, solar panels how much capital would that be per panel. In other words if the capital currently invested in power plants were to be transitioned (over 40-50 years) to 10% efficient solar panels covering 100 miles square we would have about 100 dollars to buy a 1 meter square panel. So how much do solar panels cost now? Hard to price online, but I found a retail offer of 3,150 watt system (with inverter) system (18 panels) for $15,907. 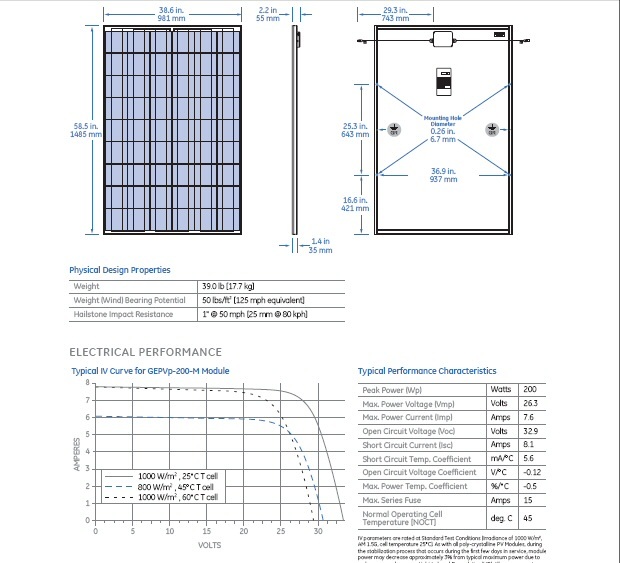 If the panels were a m^2 @ 15% efficiency, there would be 3150w/150w = 21 panels @ m^2 size, so cost (retail) per meter of panel is about $15,907/21 = $757 per m^2. Now of course with solar the fuel is free, but distribution costs would be high. I read that currently about half the cost of electricity is generation and half distribution. Bottom line --- Hip shot analysis says that transitioning the same level of investment in electrical capacity we have now to solar panels would provide (roughly) $100 for a square meter of panel, but a square meter of (silicon) solar panel today costs (about) $750 or x7.5 times higher. There's the challenge. But if over time solar's cost could be reduced by, say, a factor of two or so, and maybe coal's cost will rise (x1.3 -1.5) due to carbon capture, then solar's cost penalty might close to x2-3 over coal. Thus while solar electricity would be expensive, its cost would not be outrageously high and certainly could be afforded when fossil fuels run out! Nathan Myhrvold, former chief technology officer at Microsoft now working on solar power, makes two interesting points. One, the green house gas emissions to build a build a solar plant are about x3 higher (he doesn't detail why) than building a coal plant. So you need to operate the solar plant for three years just to get even with a coal plant. He says if we build huge amounts of solar plants over the next 30 to 50 years, building more and more each year. All these extra emissions add up, so the lower emission benefit doesn't really kick in until solar construction flattens out and this could be in 30 to 50 years. Bottom line very little short term (30 to 50 years) benefit to solar, the emission benefit is in the out years. Aug 2008 --- A massive 800 MW solar phototvoltagic plant is announced in New York Times. 800 Mw is x10 to x20 than the few existing large solar fields. 800 mw is the peak power, the average is about four times smaller. Headline: PG&E (Calf utility) Signs Massive 800 MW PV Solar Deals With OptiSolar, SunPower" Optisolar is to provide 550 mw of solar panels and SunPower 250 mw. March 2009 --- OptiSolar announces it is shutting down and laying off all its 200 employees! They had 600 employees a few months earlier at the end of 2008. The story says, "First Solar bought its most valuable assets--its hundreds of megawatts of utility-scale PV deals in the pipeline" I later found an article on what happened to the 322 million (private) investment in OptiSolar. OptiSolar was a startup that attempted to enormously scale up volume (cells, glass making, frames etc) all the basic steps in amorphous silicon solar panel (5.5% efficient) manufacture to drasticlly cut costs. They also had grandiose plans to build and operate the solar parks themselves, meaning they would be selling their solar panels to themselves, and were buying up land and rights. The model was high volume, highly automated DRAM semiconductor plants that typically cost a half billion dollars to build. First Solar appears to be the most successful solar panel manuf. They have been added to the S&P 500. Their web site lists only one solar panel! It's a small 50 to 70 watt (about 4 ft x 2 ft) panel build cadmium sulfide with efficiency of 9 to 10%. Their panels are used in 6 mw (Rote Jahne), 8 mw, 40 mw all in Germany, 10 mw in Nevada, 5 mw in Spain. There is no mention on the First Solar site (Nov 2009) of the PG&E planned 800 mw plant! The SunPower site link to utility projects is dead! PG&E site says, May 2009 signed for a 110 mw plant from BrightSource Energy at Ivanpah, Calif. But this is not photovoltaic. BrightSource is a US Israeli company doing solar thermal using a central tower with mirrors. In March 2009 PG&E they announce a new 500 mw five year plan. PG&E will build themselves a lot of 1 mw to 20 mw solar photovoltaic fields totally 250 mw. They will contract for the other 250 mw. Here's a simple circuit model of a solar panel. Left is two photocells connected in series and right the curve tracer i-v plot of a photocell with and without light. I looked online for a good model and couldn't find one, so I worked it out and drew it up. A pn type photocell is basically just a diode that squirts out current. (I read there is another type of photocell that has no pn junctions, but at this point I don't know anything about them.) The lower right quadrant (4th quadrant?) of my i-v plot with light is what is used on solar panel datasheets, except it's flipped (positive current for an active photocell being out, while for a passive diode it's in). A photocell model is very simple, just a ideal diode with a small series resistor in parallel with a light induced current source. This simple model matches the i-v characteristics shown on real solar panel data sheet (above) quite well. When no load is connected, all the light induced current cycles around through the diodes so the panel voltage is maxim due to the series resistors. As current is drawn externally, current is diverted from the diodes so the voltage sags a little. When the voltage sags enough to turn off the diodes, the current (see the GE datasheet I-V curve above) is remarkably constant. From the model I noticed something interesting that must be of practical importance, but I found only one reference to it in a web search. In this model there is no (good) way for the current to divert around a dark cell. The one reference I found was somebody saying two solar installers told him that one bird crap could reduce the "efficiency" of a solar panel by 90%. In a big solar panels there are a lot of cells in series, probably 50 cells x 1/2 V/cell for 200 watt 5 x 3 ft, 26 volt GE panel (above). 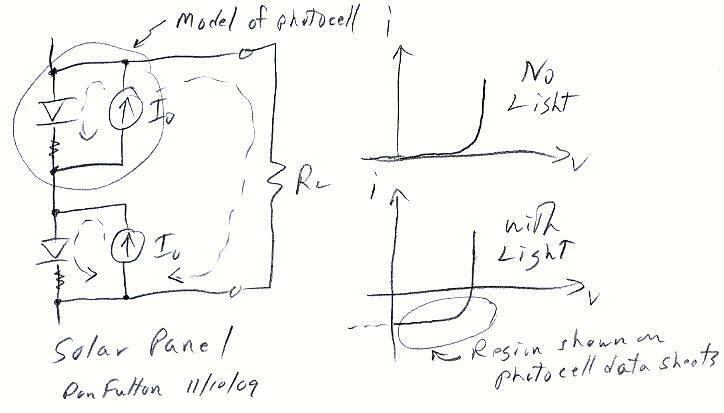 What the circuit model shows is that it current from lighted cells would break down the dark photocell diode. I don't know what the breakdown voltage is, but it's probably pretty low, say 5V. So breakdown might not be too bad, a loss say of 25 W (5A x 5V = 25 watts) from a 200 W panel, but still at 25 watt dissipation the dark cell would get pretty hot. There is however a simple fix for tolerating a dark cell, just add an anti-parallel diode, probably by integrating it in (though it could be added externally). Whether this is done or not I don't know. With more reading I find panel specs with no "bypass diode". Wikipedia appears to say use of anti-parallel diodes is spotty. In a photocell light increases the minority carriers in proportion to the photons absorbed. Note it makes no difference if the photon is absorbed in P or N region since it make a hole-electron pair. Short terminals and then turn on light. It's easy to see the forward bias current is unaffected because the terminal voltage is unaffected (V = 0). But the minority current (swept by the E field) increases in proportion to the increase in minority carriers caused by the light, and it flows out of P terminal in the external short. This explains the 0V points decreasing in current as light strengthens. The efficiency of single junction photocells (most of the market) is pretty simple. Each semiconductor has a bandgap (measured in volts). The theoretical maxim efficiency of a cell illuminated with monochromatic light with eV photons that are just slightly above the bandgap is very high (about 85%). But sunlight is far from monochromatic, it's a fairly wide quasi-blackbody spectrum with about half the energy in the infrared below visible light. Work is going on to exploit high monochromatic efficiency of photocells. Exotic thermophotovoltaic systems envision concentrating (wide spectrum) solar energy onto heat emitters that get real hot and reradiate the energy in a narrow band matched to photocells. With a solar spectrum all photons with lower ev (lower frequency) than the bandgap are unable to knock an electron free, so either pass through or are absorbed as heat. All higher ev photons will make one hole-electron pair, but only the fraction of the ev at the bandgap tributes to the electrical power. For example, a photon at 2ev of the bandgap contributes half its energy to electricity and half to heat. The maximum theoretical efficiency of single gap cells, first calculated by Shockley in 1961, is about 31% (without concentration). Below shows Si with its bandgap of about 1.1 ev is not too bad. It converts the upper end of the infrared efficiently and and about half the energy in visible photons. This plot shows where in the solar spectrum is the energy. 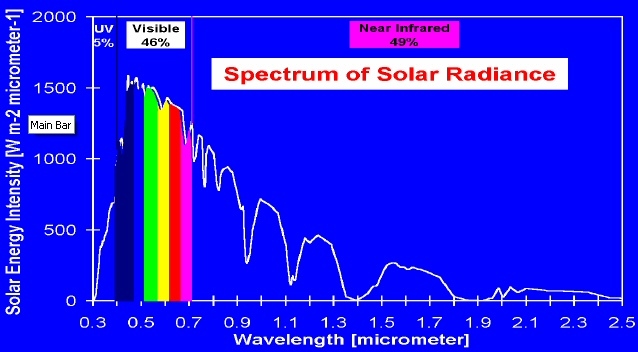 About half is visible photons, about half below visible in infrared, and just 5% above visible in the ultraviolet. The active absorber in non-silicon thin film photocells can be really thin. CdTe (cadmium telluride) thickness is 10 um (1% of a mm, 10^-5 m). The amount of semiconductor material needed per watt is reduced by x50 to x100 times compared to standard Si photocells. A fundamental reason some non-silicon cells can be so thin, is that that they are much more opaque than silicon, more than x10 more absorbent. CdTe is the speciality of USA (Ohio) company First Solar who manufactured 200 MW of CdTe solar panels in 2007, about 9% market share. They built the big 6 MW solar field in Germany. The only have one product a 75 watt, 10% efficient panel (1.1A @ 68V, 116 cells, no bypass diode). Cadmium is a byproduct of zinc production. Commonly 3rd generation solar cells use dyes. Finally found a paper that explained in simple terms how they work. It looks like instead of charge separation being provided by the E field of a pn junction it depends on a metal semiconductor diode structure. Dye-sensitized solar cells (DSCs) are currently being explored as ultra-low-cost solar cells. DSCs utilize three main components to perform photo-electro conversion which are metal oxide semiconductor nanostructures, dye, and electrolyte. A dye is used to create electron hole pairs and other two materials transport theses photogenerated charge carriers to the electrodes. In other words it looks like all types of solar cells use a diode structure for charge separation of photon generated hole-electron pairs (perhaps via intermediate excitons) either standard pn junction type diodes (most commercial cells) or metal-semiconductor schottky type diodes for news (R&D) 3rd generation solar cells. A key issue is what mechanism in various types of photocells does charge separation: drift (E field) or diffusion (gradient). Diffusion is mentioned as being the key mechanism only in 3rd generation photocells like die types. So called 'quantum dots' are nm size particles that exploit quantum principles. In principle the 'effective bandgap' depends on the particle size, so a range of bandgaps is possible by mixing different types of quantum dots. Another theoretical advantage is that via quantum principles (exploiting excitons, see below) a photon with ev say x3 the effective bandgap can create x2 or x3 hole electron pairs. This pushes the theoretical efficiency of the panel high and theoretically allows small bandgaps to be used to pull energy from infrared while still working fairly efficiently with high ev of visible photons. Still a third theoretical advantage is that a tightly order grid of quantum dots via quantum coupling & tunnelling might be able to pass along energy very efficiently. The usual reference for this is the highly efficient ("non-radiative") way photosynthesis passes energy from antenna molecules to the reaction centers via quantum coupling. "An immediate optical feature of colloidal quantum dots is their coloration." Quantum dots are now widely used in dyes for biological analysis because they are x20 times brighter and x100 times more stable than traditional dyes. I first though I understood this, writing "the dots are so small that some reasonable fraction of hole and electron pairs diffuse? to the conducting matrix". But upon reflection this makes no sense. An electron coming out of one side of the dot and an electron going in another side (eq to hold coming out) cancel. There needs to be a voltage, or some means in the matrix, to separate hole and electron. -- "Quantum dots produce "excitons," consisting of electrons loosely bound to positive holes. Solar cells employing quantum dots must dissociate the excitons into electrons and holes that must then migrate to the cell terminals without recombining." More reading shows how to separate charges, especially from multiple excitons from a high ev photon, is one of the major engineering challenges. Calculated maximum theoretical effiency with quantum dots for unconcentrated sunlight is 44% vs 31% for single silicon pn junctions. The separation problem is why another approach to using quantum dots is to put them in an intrinsic layer inside between p and n layers. In this way the quantum dots can absorb (making say a small band gap for infrared absorption) with the electric field of the pn junction doing the charge separation. A solar cell of this type would be expensive, but potentially have higher efficiency. I had never heard of an 'exciton' until I started reading about quantum dots. Turns out an exciton is a loosely bound hole - electron pair that acts like a low mass particle. In a semiconductor its energy (vibrational energy probably) is about 0.1 ev, but it can be as high as 1 ev in some materials. They have fairly long lifetimes, as long as msecs in some materials. (Though a paper I read showed more like 50 nsec for CdSe nano-particles) The electron is prevented from falling into the hole because of the inability to lose energy. An exciton can be created directly by a photon. If the energized electron pops out yet remains loosely bound to the hole it has just created, then we have an exciton. I read that in ordinary solar cells they speak of the photon first creating an excitron, which is then separated by the E field of the pn junction. The interesting thing is that an exciton being mobile allows energy to be transported through a material, but consisting of an electron and hole there is no current flow. In quantum dots the mechanism of high energy photons generating more than one electron is described as the photon first creating a high energy excitron , and then the exciton lowers its energy by creating additional excitons. But a news report in 2008 indicated many researchers (including from MIT) found the effect is much weaker than first reported in 2004 (which was up to seven electrons/photon). New reports are the multiplier is only 1.25 to 1.4, indicating it probably would not be of practical use in photocells. 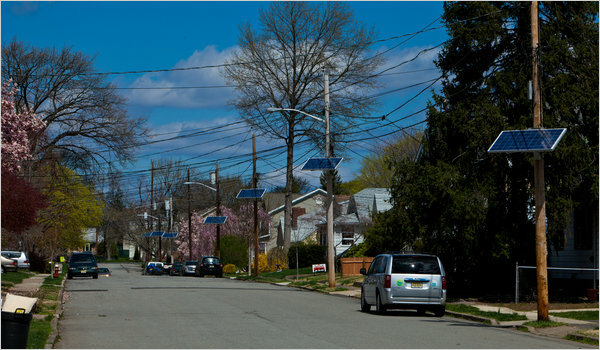 NYT ran a front page article on a huge number of 5 x 2.5 ft (220 watt) solar panels being mounted on 1/4th of the 800,000 poles of suburban NJ electric utitlity, which is working to meet a state law mandating more power from renewables. The thrust of the article were people complaining about the look of the large panels which are mounted only 15 feet above ground. The article (as usual) quotes only the peak power of the panel and states that the 200,000 panels will put out 40 Mw. Of course, this is peak power and the average in NJ is probably 6 to 8 times lower! Also there was no mention in the article of the need for 200,000 inverters, so I posted the comment below (of > 400 comments!) to address these issues. I'm a power engineer, so I can add some perspective. The 220 watt number quoted for the panel is the power in bright sunlight. What counts is the average power. Even in the southwestern desert bright sun exists (on average) 6 of 24 hours, which reduces the average power of this type of panel to 55 watts. In northern, cloudy NJ the panel's average power will be substantially lower, maybe 30 watts. If panels are mounted on 200,000 poles (200,000 separate installations), then the average power from all of them is 6 Mw (6 million watts). A standard (baseload) power plant is rated for 1,000 Mw, so the power from all these solar panels is the equivalent of 0.6% power plant. Yup, less than 1% of a baseload power plant, that's the nature of solar, it is a diffuse energy source. I checked the utility's (PSE&G) web site. They have a long FAQ on the pole project. Nowhere do they mention the inverter. They give the lifetime of the panels as 20 years. They say this: "The pole-attached solar program is the first of its kind and is the largest (40 Mw) pole-attached solar installation in the world." Half of the proposed 200,000 panels are already installed. Another 40 Mw of panels is to put in four NJ sites. "All four sites will utilize crystalline solar panel technology and have monitoring and communications functionality." Correction --- The $3,865 per panel seemed awfully high. So when I dug into it, I found the 773 million covered an additional 80 Mw of installation. The cost of the 40 Mw panel part of the project was 264 million or 1,320 per panel. This makes the annual return 3% or so, still very low. No mention of whose solar panels are being used in NJ, but I did find this on a 12 Mw Ohio solar field with 159,000 panels (eq to 75 watt panels) that has been built by PSEG solar a subsidiary of PSEG. -- First Solar supplied the 159,200 solar panels, most produced at their Perrysburg, OH manufacturing facility. SMA America of Rocklin, CA supplied the 16 Inverters that convert the DC power generated by the solar panels to AC power for export to the grid. MTC Transformers of Wytheville, VA provided the 8 Transformers that increase the voltage to make it grid compatible. Schletter Inc. of Tucson, AZ supplied the racking systems that supports the solar modules. Al Gore's concern for global warming has begun to morph into a combo concern for global warming and energy shortages. Recently he gave a highly publicized speech pushing for the US to convert its total electrical electrical supply production over the next decade to 'carbon free' sources: "sun, the winds and other environmentally friendly sources of power". Whether 'environmentally friendly' includes (in Gore's mind) nuclear power is apparently an exercise for the reader. I read Gore's big 7/17/08 energy speech, and it's quite amazing. He repeatly talks abou the need for being 'bold' in addressing this problem, but the word 'nuclear' never comes out of his mouth. He doesn't say shut down the nuclear plants (currently providing about 20% of US electrical power) or build more, he just says nothing. Oh, yes! the political courage of the 'green' wing of the Democratic party. The next day the NYT reported ( maybe someone asked Gore a question) that his position on nulear power was leave the nuclear plants open, but build no more. Anyway one of the three technologies that (apparently) Gore and the green's are pushing (besides solar and wind) is geothermal. One nice feature of geothermal, unlike solar and wind, is that it is continuous, so it naturally makes for base load plants. The (new) geothermal technology being pushed is a technique called is 'Enhanced Geothermal Systems', sometimes called 'Engineered Geothermal Systems' (EGS). This is different from the type of existing geothermal power now used in few places in the world like Iceland, which are near volcanos and where below ground heat is close and very hot. This source of geothermal power is very limited and mostly tapped out. Enhanced geothermal involves drilling down to (about) 10 km (6.25 mile) and injecting water to tap the 300C heat in the rocks. A 10 km hole is doable, but it's deep. This is deeper than 'ultra deep' oil and gas wells, which in the report are shown as mostly 6-7 km. The report says 'only two or three wells' have ever been drilled in the US that are even close to 10 km. Rocks at 10 km are below most sedimentary rocks and are mostly igneous granite, often called basement rocks. The heat in rocks at this depth is due to the out flow of heat from deeper in the earth and to decay of radioactive elements within the rocks at this depth, mostly uranium, thorium and potassium (no ratio was given). The heat is brought up in the form of heated water that is used to run turbines. The waste heat is dumped into the air with (large) cooling towers. The cooling towers need to be large, because due to the low temperature of the operating fluid the waste heat is high, two or three times higher than a nuclear plant with the same electrical output. Also the report assumes that in most locations surface water needs to be available to run the plant, both for injection and to cool the cooling tower. Clearly this is a problem in much of the American West. There are several (small) geothermal power plants in the Imperial Valley of CA, which coexist with intensive farming. One plant is 50 Mw. Rocks of this temperature (300 C) at this depth are thought to exist over a large areas of the American West (see map below). I tracked down what appear to be the major reference on enhanced geothermal. It's a 372 page document, called "The Future of GeoThermal Energy" published by MIT in 2006 (written by a panel of 12 chaired by Jefferson Testor, a chemist at MIT). Temperatures from 200 C (?) and higher are usable. Skimming the report I found a few interesting number and facts, which of course, the politicians never mention. For a standard 1,000 Mw plant the (surface) area required is 21 km^2. This 1,000/21 = 47.6 w/m^2. For perspective the (minimum) area for a solar plant, based on the recoverable energy in sunlight, is in the neighborhood of 25w/m^2 (1,000 w/m^2 x 10% efficiency x 1/4 to yield continuous power), so enhanced geothermal plants, like solar, are big. The geothermal plant coming in at about 1/2 the area of a solar plant! A key question to ask of any new energy source is what fraction of the potentially recoverable energy you need to expend to recover it. In other words how much energy does it take to do the drilling and processing compared to the energy recovered. This is an indication of its real cost and allows potential new energy sources to be compared. I did not see this important point addressed in the report. For example, if you need to expend the energy equivalent of 101 barrels of oil to drill and recover the equivalent energy of 100 barrels of oil, then this energy store is totally unusable. It's crazy to drill. This is exactly the case in some of the old oil wells in the Gulf of Mexico that recently got destroyed in a hurricane. While they were OK, it was profitable to keep pumping them, but they will not be redrilled because the cost to redrill exceeds the profit that can be recovered. At another point in the report the sustainable extractable power is given as only 26 millewatts per cubic meter of rock reservoir. This is a tiny number, but of course volume scaling results in a much rosier outlook. Scaling 26 mw/m^3 to a cubic km gives 26 Mw/km^3. Scaling up to a 1,000 Mw plant we would need 38 cubic km of rock reservoir (1,000/26 = 38). A 38 km^3 reservoir is basically consistent with the claimed surface area of 21 km^2 for a 1,000 Mw plant since (21 km^2 x 1.8 km deep = 38 km^3). From what I see in the report these plants are taping what is essentially a non-renewble resource! In many ways it is a lot like drilling for oil. The most suitable areas are those with rocks that have high porosity and permeability (permeability is interconnected pores) and high thermal conductivity. But the report says we know from oil and gas drilling that most heat is in rocks with low permeability, so the goal of EGS is to figure out how to tap this heat. The preferred sites would have water at depth, though if water is available on the surface it can be pumped in. The average heat flow through the earth's crust is very low, given in the report as 59 mw/m^2. Note the heat power flowing up from below is about 4,000 times less than heat power coming in from above (1/4 x 1,000 w/m^2/0.059 w/m^2 = 4,237). Footnotes in the report assume new holes will drilled every five years (one reason the surface area is so big), and the plant lifetime is only 20 years! This translates into plants that need to slowly crawl across the surface to reach new hot rocks. The greens, having dedicated themselves to 'renewable' sources of energy, desperately want to claim this energy source is renewable, and in fact I have seen it so labeled with the explanation that it's renewable because of continuing decay of radioactive material. This, of course, is total nonsense. This is heat mining plain and simple. It's no more renewable on the time scale of man than is oil and gas. Gore in his big energy speech cleverly avoids mentioning the fact that (enhanced) geothermal is not renewable. Another example of Gore boldness. Since these rocks are not very hot, this is low quality heat, meaning a lot of heat in a big mass. Thus conversion efficiencies are limited by thermodynamics (Carnot cycle). A footnote in the report says the conversion efficiency (no temp was given) was assumed to be 10% (for a 'binary' plant). To illustrate the heat stored in rocks the report gives this simplistic (their name) example: a volume of rock 14 km x 14 km x 1 km deep (200 km^3) if cooled 200C (250C to 50C) would release heat equal to the total energy consumption in the US for a year. Funding for EGS in the US is poor. The Dept of Energy recently reduced their EGS budget from 20 million to zero. In 2007 congress put back in 90 million, but the dept of Energy still only has 30 million of this in its 2009 budget vs 400 million for coal. However, Germany, as with solar, is spending quite a bit on EGS. Canada is spending almost zero on EGS, putting all its money into oil from tar sands. Where are the oil & gas companies? This seems (to me) to be a natural business for the oil companies (& oil service companies) to expand into. Do they have any interest in this business? Not that I have seen. This either indicates that the technology is still poorly developed, meaning a lot of R&D, time, and risk taking are required, or the underlying economics are just not that good. And yes, ethanol can be made from switch grass, which grows in abundance on the prairies of the Great Plains. If grass had ambition (besides wanting to propagate), the panicum virgatum might see itself as a cure for global warming and a savior of the family farm. If burning compressed switch grass really does work to reduce the use of fossil fuels, it would reduce the carbon we release into the air. Then farmers could find new profits in growing the stuff. And the more, the better. Switch grass, like every other plant, takes carbon dioxide out of the air and uses it to build plant tissue. Switch grass cleans water as well as air; its wide-spreading roots filter out pesticides, herbicides and excess fertilizer before they reach the waterways. Up in Manitoba, Canada, where they care deeply about staying warm, they're experimenting with stoves that burn pellets of switch grass. Family farmers know that switch grass is easy to grow. It doesn't complain about growing in sand; it doesn't mind clay either. It's tolerant of floods as well as of droughts. It would work as part of the effort to restore the Louisiana wetlands that can help protect New Orleans from hurricanes. Switch grass is native to most of North America, from Canada to Texas. Let's not forget that switch grass is beautiful and looks great in floral arrangements. On the very same day the president spoke, I got the latest Brooklyn Botanic Garden handbook, ''Designing Borders for Sun and Shade,'' in the mail. The handbook strongly recommended switch grass as part of a perennial border. There's ''Dallas Blues,'' ''Alamo,'' and the prettiest, wine-red ''Shenandoah.'' The handbook suggests combining switch grass with asters, sunflowers and black-eyed Susans for an all-native garden with a nice prairie feel. This article was reported by Alexei Barrionuevo, Simon Romero and Michael Janofsky and written by Mr. Barrionuevo. Dozens of factories that turn corn into the gasoline substitute ethanol are sprouting up across the nation, from Tennessee to Kansas, and California, often in places hundreds of miles away from where corn is grown. Once considered the green dream of the environmentally sensitive, ethanol has become the province of agricultural giants that have long pressed for its use as fuel, as well as newcomers seeking to cash in on a bonanza. The modern-day gold rush is driven by a number of factors: generous government subsidies, surging demand for ethanol as a gasoline supplement, a potent blend of farm-state politics and the prospect of generating more than a 100 percent profit in less than two years. The rush is taking place despite concerns that large-scale diversion of agricultural resources to fuel could result in price increases for food for people and livestock, as well as the transformation of vast preserved areas into farmland. Even in the small town of Hereford, in the middle of the Texas Panhandle's cattle country and hundreds of miles from the agricultural heartland, two companies are rushing to build plants to turn corn into fuel. As a result, Hereford has become a flashpoint in the ethanol boom that is helping to reshape part of rural America's economic base. Despite continuing doubts about whether the fuel provides a genuine energy saving, at least 39 new ethanol plants are expected to be completed over the next 9 to 12 months, projects that will push the United States past Brazil as the world's largest ethanol producer. The new plants will produce 1.4 billion gallons a year, a 30 percent increase over current production of 4.6 billion gallons, according to Dan Basse, president of AgResources, an economic forecasting firm in Chicago. By 2008, analysts predict, ethanol output could reach 8 billion gallons a year. For all its allure, though, there are hidden risks to the boom. Even as struggling local communities herald the expansion of this ethanol-industrial complex and politicians promote its use as a way to decrease America's energy dependence on foreign oil, the ethanol phenomenon is creating some unexpected jitters in crucial corners of farm country. A few agricultural economists and food industry executives are quietly worrying that ethanol, at its current pace of development, could strain food supplies, raise costs for the livestock industry and force the use of marginal farmland in the search for ever more acres to plant corn. "This is a bit like a gold rush," warned Warren R. Staley, the chief executive of Cargill, the multinational agricultural company based in Minnesota. "There are unintended consequences of this euphoria to expand ethanol production at this pace that people are not considering." Mr. Staley has his own reasons to worry, because Cargill has a stake in keeping the price of corn low enough to supply its vast interests in processed food and livestock. But many energy experts are also questioning the benefits of ethanol to the nation's fuel supply. While it is a renewable, domestically produced fuel that reduces gasoline pollution, large amounts of oil or natural gas go into making ethanol from corn, leaving its net contribution to reducing the use of fossil fuels much in doubt. As one of the hottest investments around, however, few in farm country want to hear any complaints these days about the risks associated with ethanol. Archer Daniels Midland, the politically connected agricultural processing company in Decatur, Ill., and the industry leader that has been a longstanding champion of transforming corn into a fuel blend, has enjoyed a doubling in its stock price and profits in the last year. One ethanol producer has already sold shares to the public and two more are planning to do so. And the get-rich-quick atmosphere has drawn in a range of investors, including small farm cooperatives, hedge funds and even Bill Gates. For all the interest in ethanol, however, it is doubtful whether it can serve as the energy savior President Bush has identified. He has called for biofuels — which account for just 3 percent of total gasoline usage — to replace roughly 1.6 million barrels a day of oil imported from the Persian Gulf. To fill that gap with corn-based ethanol alone, agricultural experts say that production would have to rise to more than 50 billion gallons a year; at least half the nation's farmland would need to be used to grow corn for fuel. But that isn't stopping out-of-the-way towns looking for ways to pump life into local economies wracked by population loss, farm consolidation and low prices from treating the rush into ethanol as a godsend. "These projects are bringing 100 new jobs to our town," said Don Cumpton, Hereford's director of economic development and a former football coach at the high school. "It's not as if Dell computer's going to be setting up shop here. We'd be nuts to turn something like this down." That the United States is using corn, among the more expensive crops to grow and harvest, to help meet the country's fuel needs is a testament to the politics underlying ethanol's 30-year rise to prominence. Brazilian farmers produce ethanol from sugar at a cost roughly 30 percent less. But in America's farm belt, politicians have backed the ethanol movement as a way to promote the use of corn, the nation's most plentiful and heavily subsidized crop. Those generous government subsidies have kept corn prices artificially low — at about $2 a bushel — and encouraged flat-out production by farmers, leading to large surpluses symbolized by golden corn piles towering next to grain silos in Iowa and Illinois. While farmers are seeing little of the huge profits ethanol refiners like Archer Daniels Midland are banking, many farmers are investing in ethanol plants through cooperatives or simply benefiting from the rising demand for corn. With Iowa home to the nation's first presidential caucuses every four years, just about every candidate who visits the state pays obeisance to ethanol. "There is zero daylight" between Democrats and Republicans in the region, said Ken Cook, president of Environmental Working Group, a nonprofit research policy group in Washington, and a veteran observer of agricultural politics. "All incumbents and challengers in Midwestern farm country are by definition ethanolics." The ethanol explosion began in the 1970's and 1980's, when ADM's chief executive, Dwayne O. Andreas, was a generous campaign contributor and well-known figure in the halls of Congress who helped push the idea of transforming corn into fuel. Ethanol can be produced from a number of agricultural feed stocks, including corn and sugar cane, and someday, wheat and straw. But given the glut in corn, the early strategy of Mr. Andreas was to drum up interest in ethanol on the state level among corn farmers and persuade Washington to provide generous tax incentives. But in 1990, when Congress mandated the use of a supplement in gasoline to help limit emissions, ADM lost out to the oil industry, which won the right to use the cheaper methyl tertiary butyl ether, or MTBE, derived from natural gas, to fill the 10 percent fuel requirement. Adding to its woes, ADM was marred by scandal in 1996 when several company executives, including one of the sons of Mr. Andreas, were convicted of conspiracy to fix lysine markets. The company was fined $100 million. Since then, ADM's direct political clout in Washington may have waned a bit but it still pursues its policy preferences through a series of trade organizations, notably the Renewable Fuels Association. Some 14 months ago the company hired Shannon Herzfeld, a leading lobbyist for the pharmaceutical industry. But she is not a registered lobbyist for ADM and said in an interview that the company was maintaining its long-held policy that it does not lobby Congress directly. "Nobody is deferential to ADM," contended Ms. Herzfeld, who says she spends little time on Capitol Hill. But ADM has not lost interest in promoting ethanol among farm organizations, politicians and the news media. It is by far the biggest beneficiary of more than $2 billion in government subsidies the ethanol industry receives each year, via a 51-cent-a-gallon tax credit given to refiners and blenders that mix ethanol into their gasoline. ADM will earn an estimated $1.3 billion from ethanol alone in the 2007 fiscal year, up from $556 million this year, said David Driscoll, a food manufacturing analyst at Citigroup. ADM has huge production facilities that dwarf those of its competitors. With seven big plants, the company controls 1.1 billion gallons of ethanol production, or about 24 percent of the country's capacity. ADM can make more than four times what VeraSun, ADM's closest ethanol rival, can produce. Last year, spurred by soaring energy prices, the ethanol lobby broke through in its long campaign to win acceptance outside the corn belt, inserting a provision in the Energy Policy Act of 2005 that calls for the use of 5 billion gallons a year of ethanol by 2007, growing to at least 7.5 billion gallons in 2012. The industry is now expected to produce about 6 billion gallons next year. The phased removal of MTBE from gasoline, a result of concerns that the chemical contaminates groundwater and can lead to potential health problems, hastened the changeover. Now, government officials are also pushing for increasing use of an 85-percent ethanol blend, called E85, which requires automakers to modify their engines and fuel injection systems. In the ultimate nod to ADM's successful efforts, Mr. Bodman announced the new initiatives in February at the company's headquarters in Illinois. "It's been 30 years since we got a call from the White House asking for the agriculture industry, ADM in particular, to take a serious look at the possibilities of building facilities to produce alternative sources of energy for our fuel supply in the United States," said G. Allen Andreas, ADM's chairman and Dwayne Andreas' nephew. Now, ADM is betting even more of its future on ethanol, embracing a shift from food processing to energy production as its focus. In April, it hired Patricia A. Woertz, a former executive from the oil giant Chevron, as the company's new chief executive. While ADM has pushed ethanol, rivals like Cargill have been more skeptical. To Mr. Staley, ethanol is overpromoted as a solution to the nation's energy challenges, and the growth in production, if unchecked, has the potential to ravage America's livestock industry and harm the nation's reliability as an exporter of corn and its byproducts. "Unless we have huge increases in productivity, we will have a huge problem with food production," Mr. Staley said. "And the world will have to make choices." Last year corn production topped 11 billion bushels — second only to 2004's record harvest. But many analysts doubt whether the scientists and farmers can keep up with the ethanol merchants. "By the middle of 2007, there will be a food fight between the livestock industry and this biofuels or ethanol industry," Mr. Basse, the economic forecaster, said. "As the corn price reaches up above $3 a bushel, the livestock industry will be forced to raise prices or reduce their herds. At that point the U.S. consumer will start to see rising food prices or food inflation." And even Cargill is hedging its bets. It recently announced plans to nearly double its American ethanol capacity to 220 million gallons a year. Meanwhile, the flood of ethanol plant announcements is making the American livestock industry nervous about corn production. "I think we can keep up, assuming we get normal weather," said Greg Doud, the chief economist at the National Cattlemen's Beef Association. "But what happens when Mother Nature crosses us up and we get a bad corn year?" Beyond improving corn yields, the greatest hope for ethanol lies with refining technology that can produce the fuel from more efficient renewable resources, like a form of fuel called cellulosic ethanol from straw, switchgrass or even agricultural waste. While still years away, cellulosic ethanol could help overcome the concerns inherent in relying almost exclusively on corn to make ethanol and make the advance toward E85 that much quicker. "The cost of the alternative — of staying addicted to oil and filling our atmosphere with greenhouse gases, and keeping other countries beholden to high gasoline prices — is unacceptable," said Nathanael Greene, senior policy analyst at the Natural Resources Defense Council in New York. "We have to struggle through the challenges of growing and producing biofuels in the right way." But the current incentives to make ethanol from corn are too attractive for producers and investors to worry about the future. With oil prices at $70 a barrel sharply lifting the prices paid for ethanol, the average processing plant is earning a net profit of more than $5 a bushel on the corn it is buying for about $2 a bushel, Mr. Basse said. And that is before the 51-cent-a-gallon tax credit given to refiners and blenders that incorporate ethanol into their gasoline. "It is truly yellow gold," Mr. Basse said. A new federal report concludes that the ability to make fuel efficiently from virtually any kind of plant is within reach, offering the promise of a technology that could dramatically benefit the environment, slash dependence on foreign oil, and one day even reorder the global balance of power. The Department of Energy report, to be released soon, offers a road map for moving from today's technology that makes the fuel ethanol from cornstarch to a new approach using cellulose, the main ingredient in most plants. That would greatly increase the country's ability to produce ethanol, which can easily be used in most automobiles, and create unexpected sources of energy from the rice paddies of California to the paper mills of northern New England. ``I think this is very doable," said Sharlene C. Weatherwax, a program manager in the department's Office of Science, which helped prepare the report. ``This is not a blue-sky exercise for us." The report lays out an ambitious plan, a kind of Manhattan Project for biofuels, for solving the central obstacle: the high cost of production. The report, prepared in consultation with top scientists in academia, industry, and the government, envisions solving the underlying scientific problems over the next five years, followed by a 10-year program of transferring these advances to industry. Scientists cautioned that it is impossible to predict how rapidly they will progress, but the report will add momentum to a field that has suddenly become very hot. President Bush called for the development of cellulosic ethanol in his State of the Union address in January, singling out switchgrass, a tall grass that grows on the North American prairie, as a potential source. In the past few months, Goldman Sachs and Silicon Valley venture capitalists as well as Bill Gates have been investing in cellulosic ethanol companies. Several companies are seeking to build experimental cellulosic ``biorefineries" around the world, and the Energy Department to support efforts to build them in America. Driving the enthusiasm is the high price of oil, which has made alternatives more attractive. But the field itself has been progressing, as new biological tools -- particularly the ability to modify the genetic makeup of organisms -- have made thorny problems seem more tractable. At the same time, leading thinkers from across the political spectrum have come to see dependence on foreign oil as the root cause of many of the nation's challenges. Fundamentally, traditional fossil fuels and ethanol are plant power. Fossil fuels are plant matter that has been subjected to heat and pressure over millions of years, leaving it in forms that are easy to burn such as coal or oil. This has traditionally been the least expensive option, but it also releases huge amounts of carbon and other materials into the air, causing pollution and trapping heat from the sun in the atmosphere. Ethanol production turns plant material directly into fuel by breaking it down into alcohol. As plants grow, they remove from the atmosphere the carbon dioxide that contributes to global warming. Today, ethanol is mostly made from corn kernels, but the benefits are modest because the manufacturing process requires a lot of fossil fuels and because of limits on corn production. For several decades, however, scientists have worked on creating ethanol from cellulose, the long chains of sugars that give plants their toughness, according to Chris Somerville , a plant biologist with the Carnegie Institution and Stanford University who helped prepare the Department of Energy report. Studies have shown this would bring larger environmental advantages because much more fuel could be made using the same amount of energy. Automobiles on the road today can use a blend of 10 percent ethanol and 90 percent gasoline, but it costs no more than about $200 extra to manufacture a ``flex fuel car" that can use up to 85 percent ethanol. There are already more than 5 million flex fuel cars being driven in the country, and General Motors and Ford have said they plan to accelerate their efforts. Veterans of past alternative-energy booms agree that there is palpable excitement now but that this same excitement has come and gone in the past.``There is no question that interest waxes and wanes based on the price of oil compared to alternatives," said David Barclay , executive director of the Northeast Sustainable Energy Association. Barclay said many alternatives need government financing to be competitive because they are still operating on a relatively small scale. Cellulose is much more difficult to process than corn kernels, making it prohibitively expensive. The Energy Department estimates that, using current technology, it would cost about $2.26 per gallon to make cellulosic ethanol, according to John Ferrell , an engineer in the department's Office of the Biomass Program, which helped prepare the new study. This estimate does not include the cost of distributing the fuel, which would make it more expensive than gasoline even at the current high prices. To make ethanol, a manufacturer must break down the plant cell walls using harsh chemicals, then use enzymes that can break down the cellulose into the small molecules of sugar that make it up. These sugars are then fermented by placing them in large vats with microorganisms that convert the sugar into ethanol. Each of these steps can be made more efficient using a wide range of approaches, especially genetics. For example, plants could be genetically modified so that it's easier to break down the cell wall, getting access to the cellulose. A number of companies and academic scientists are already working on new solutions. Agrivida , a Cambridge-based start-up created by two MIT graduates, hopes to create genetically modified plants that can create the enzymes needed to break down their own cellulose. The plants would grow the enzymes so that they are inactive until subjected to high heat, preventing them from degrading the plant while it is still growing, according to R. Michael Rabb , one of the company's founders. Another company, Mascoma , was founded this year by longtime cellulosic ethanol researcher Lee R. Lynd , a professor of engineering at Dartmouth College in Hanover, N.H. They have created genetically modified bacteria that convert sugars into ethanol at high temperatures, making them easier to use in industrial settings. In March, Silicon Valley venture capitalist Vinod Khosla invested $4 million in the company, which is also supported by Cambridge- based Flagship Ventures .``The fact that the world is waking up to the need and potential for this technology is very exciting," said Lynd. Many other companies are involved, and more are expected to join the race. Two enzyme companies, Novozymes and Genencor International , have done research supported by the Energy Department that reduced the cost of using cellulose enzymes about 30 fold, from about $5 per gallon of ethanol to between 10 and 20 cents. The enzymes used for corn starches cost about 5 cents per gallon, according to Ferrell. In May, Genencor announced that it is joining a French project to create ethanol from wood pulp. The Department of Energy has proposed more than doubling the funding for biofuels research and development from this year's $94 million to $190 million next year, a measure Congress is now considering. Any time that OPEC got a little too overzealous in pushing up oil prices back in the 1970’s, the legendary Saudi oil minister Sheik Ahmed Zaki Yamani was fond of telling his colleagues: Remember, the Stone Age didn’t end because we ran out of stones. What he meant was that the Stone Age ended because people invented alternative tools. The oil age is also not going to end because we run out of oil. It will end because the price of oil goes so high that people invent alternatives. Mr. Yamani was warning his colleagues not to get too greedy and stimulate those alternatives. Too late — oil at $70 a barrel has done just that. One of the most promising of those alternatives is ethanol, an alcohol fuel made from corn, sugar cane or any biomass. I came to Brazil to try to better grasp what is real and what is not in the ethanol story, because no country has done more to pioneer sugar ethanol than Brazil. My impression, after talking to a range of Brazilian experts, is that not only is ethanol for real, but we have not even begun to tap its full potential. With just a few technological breakthroughs, Brazil really could be the Saudi Arabia of sugar and we could actually achieve that energy dream of getting “barrels from bushels.” Since the 1970’s oil shocks, Brazil has, with lots of trial and error, made ethanol part of its daily life. It hits you the minute you drive into a gas station in São Paulo, where you need two things: a credit card and a calculator. In rough numbers, sugar ethanol now sells here at a little over $2 a gallon and gasoline at a little more than $4 a gallon. Because sugar ethanol gets only about 70 percent of the mileage of gasoline, drivers here do the math each day and figure out if ethanol is at least 30 percent less than the price of gasoline. If it is, many will fill ’er up with sugar cane. Brazilians have that luxury because there are 34,000 gas stations here that offer both gasoline and ethanol (compared with around 700 in the U.S.) and because 70 percent of new cars sold here can run on either gasoline or sugar ethanol. As a result, Brazil has replaced about 40 percent of its gasoline consumption with sugar ethanol. I visited the Cosan sugar mill northwest of São Paulo, Brazil’s largest, where you fly in over an ocean of green sugar cane. The cane is harvested onto big lorries and trucked to the Cosan distillery. There, the juice is extracted and converted to either crystal sugar or ethanol. The remaining cane waste — called bagasse — is used to fuel huge steam boilers that produce enough electricity to both power the refining process and leave a surplus to be sold back to the grid. It’s important to understand this process to appreciate just how “much more energy we could get from sugar cane” with just a few more breakthroughs, explained Plinio Mario Nastari, one of Brazil’s top ethanol consults. Think of each stalk of sugar cane as containing three sources of energy. First, the juice extracted from the cane is already giving us ethanol and sugar. Second, the bagasse is already heating very low-technology, low-pressure boilers, giving us electricity. But if Brazil’s refiners converted to new high-pressure boilers, you could get three times as much electricity. Finally, when the cane is harvested the tops and leaves are often just left in the field. But this biomass is rich in cellulose, the carbohydrate that makes up the walls of plant cells. If the sugar locked away in cellulose also could be unlocked — cheaply and easily by a chemical process — this biomass could also produce tons of sugar ethanol. There is now a race on to find that process. A breakthrough is expected within five years, and when that happens it will be possible to extract “more than double” the amount of ethanol from each sugar stalk, said José Luiz Oliverio, a senior V.P. at Dedini, the Brazilian industrial giant, which has a pilot cellulosic ethanol project. Efforts to reduce carbon emissions are sold politically as a means of doing (a little) something about global warming, but the principal benefit of reduced carbon emissions by this generation may very well be that we consume less of the earth’s limited store of fossil fuels leaving more for future generations. It appears to be little understood that huge amounts of energy will be required to operate clean coal plants, meaning coal plants with carbon capture and storage. The extra energy required will come from burning more coal per unit of electricity, estimates are 20% to 40% more. With clean coal, unlike nearly all other alternate fuel technologies, a reduction of CO2 emissions is not accompanied by a conserving of the fuel resource, but by its more rapid depletion! This is a huge step backwards. be dumped into the atomosphere. is captured and sequested underground. buring power plants could be sequestered. Probably the most important technology needed in the fight to reduce global warming, specifically to reduce the dumping of fossil fuel CO2 into the atmosphere, is the ability to capture and sequester CO2 from the burning of coal in power plants (roughly 50% of US electricity comes from coal burning plants). Therefore you would think there would be a major push to develop this technology. Well from the outside it sure doesn't look that way. The first (production level) demonstration plant has been in the planning stage for almost seven years and still has not broken ground. It's been cancelled and sort of half assed revived with no commitment to date that it will ever be built. Why? Is the technology not really ready. Are there too few engineers who know anything about coal technology (which I suspect is true)? Is the huge amount of extra coal needed to power the CO2 capture giving people second thoughts (see my NYT posting above)? The publically stated argument for cancelling the plant was that the cost was becoming too high, but to me worrying about an extra billion or so for a demonstration plant that could change the coal industry is ridiculous. The key (USA) demonstration plant for coal carbon capture is called FutureGen. It is to be a 1/4 size (275 MW) electric plant (with hydrogen output too) 3/4th funded by taxpayers (US Dept of Energy) and 1/4th funded by industry. It was announced in 2003, and as I write it is almost seven years later (Jan 2010) site for the plant has been selected (Mattoon, Illinois), but the plant is still in the preliminary design phase! Briefly the plant was originally scheduled to break ground in 2009 and be in operation by 2012. Near the end of the Bush administration (Jan 2008) the government pulled the funding for the plant, claiming cost had doubled to 1.8 billion. (A later study review says the government miscalculated and that the plant's estimated costs had increased only 39%.) Obama administration has spend a year studying the project, resuming preliminary design work and doing new cost studies, but has still not decided if (or when) full scale funding will be resumed and what changes (if any) will be needed. In fact they have not even announced a date when they will decide! (All the DOE web site says is "early 2010".) I heard Pres Obama say today (1/30/2010) live on TV that he support "clean coal technology", but apparently this doesn't translate into any real financial support. still will be able to provide electricity for the community. Dates mentioned are construction start in 2011 with operation starting 2014, both two years out from the original dates. -- FutureGen is intended to combine and test several new technologies in a single location, including coal gasification, emissions controls, hydrogen production, electricity generation, and carbon dioxide capture and storage (CCS). -- FutureGen is to capture carbon dioxide produced during the gasification process and pump it into deep rock formations thousands of feet under ground. Plan is to sequester carbon dioxide emissions at a rate of one million metric tons per year for four years, which is the scale a Massachusetts Institute of Technology (MIT) report cites as appropriate for proving sequestration. -- FutureGen specifically targets rock formations containing saline water, as these are one of the most abundant types of geologic formations that can be used to store carbon dioxide worldwide. A study by the Global Energy Technology Strategy Program estimates the storage capacity of these saline rock formations in the U.S. to be 2,970 gigatons of carbon dioxide, compared to a capacity of 77 gigatons of carbon dioxide for all other types of reservoirs, such as depleted gas fields. Focusing on rock formations with saline water was intended to help ensure that the lessons learned from the project are broadly transferable throughout the U.S. and around the world. Hot carbon grabs the one oxygen away from hydrogen in a water molecule. This makes the gas CO and frees the hydrogen as H2 gas. Hot carbon can also grab one oxygen CO2 making CO. In practice steam is injected into the incandescent coke and reaction (1) runs goes cooling the coke (reaction is enothermic). When the coke gets too cool, air is injected, this burns the coke to CO2 (it's exothermic), which reheats the coke. When the coke gets hot enough reaction (3) runs making more CO. The steam/air cycles are repeated until the coke is used up and converted to CO + H2 mixture (syngas). EAST DUBUQUE, Ill. — The coal in the ground in Illinois alone has more energy than all the oil in Saudi Arabia. The technology to turn that coal into fuel for cars, homes and factories is proven. And at current prices, that process could be at the vanguard of a big, new industry. Such promise has attracted entrepreneurs and government officials, including the Secretary of Energy, who want domestic substitutes for foreign oil. But there is a big catch. Producing fuels from coal generates far more carbon dioxide, which contributes to global warming, than producing vehicle fuel from oil or using ordinary natural gas. And the projects now moving forward have no incentive to capture carbon dioxide beyond the limited amount that they can sell for industrial use. Here in East Dubuque, Rentech Inc., a research-and-development company based in Denver, recently bought a plant that has been turning natural gas into fertilizer for forty years. Rentech sees a clear opportunity to do something different because natural gas prices have risen so high. In an important test case for those in the industry, it will take a plunge and revive a technology that exploits America's cheap, abundant coal and converts it to expensive truck fuel. "Otherwise, I don't see us having a future," John H. Diesch, the manager of the plant, said. With today's worries about the price and long-term availability of oil, experts like Bill Reinert, national manager for advanced technologies at Toyota, say that turning coal into transportation fuel could offer a bright future. "It's a huge deal," he said. There are drawbacks; the technology requires a large capital investment, and a plant could be rendered useless by a collapse in oil prices. But interest was high even before the rise in oil prices; three years ago, the Energy Department ran a seminar on synthetic hydrocarbon liquids, and scores of researchers and oil company executives showed up. The agency that runs municipal buses in Washington, D.C., and other consumers expressed interest. But the enthusiasm was not enough to overcome the fear of a drop in oil prices. Lately, however, the price of diesel fuel, which determines the value of this coal-based fuel, also called synfuel, has soared, as has the price of natural gas, which made plants like the one at East Dubuque ripe for change. Most of the interest is in making diesel using a technology known as Fischer-Tropsch, for the German chemists who demonstrated it in the 1920's. Daily consumption of diesel and heating oil, which is nearly identical, runs more than $400 million. The gasoline market is more than twice as large, but if companies like Rentech sated the demand for diesel, the process could be adapted to make gasoline. The technology was used during World War II in Germany and then during the 1980's by South Africa when the world shunned the apartheid regime there. Now Rentech is preparing to use an updated version. Sasol, the company that has used the technology for decades in South Africa, is exploring potential uses around the world and is conducting a feasibility study with a Chinese partner of two big coal-to-liquids projects in western China. Last August, Syntroleum, based in Tulsa, agreed with Linc Energy, of Brisbane, Australia, to develop a coal-to-liquids plant in Queensland. Other projects are in various stages of planning in this country, although the one here on the Mississippi River just south of the Wisconsin border has a head start. But people who think this technology will find wide use presume some kind of environmental controls, which the Rentech plant, thus far, does not have. Some environment and energy experts doubt that the method is compatible with a world worried about global warming. Unless the factory captures the carbon dioxide created during the process of turning coal into diesel fuel, the global warming impact of driving a mile would double. "It's a potential disaster for the environment if we move in the direction of trying to create a big synfuel program based on coal to run our transportation fleet," said Daniel A. Lashof, of the Natural Resources Defense Council. "There's a brown path and a green path to replacing oil, and Fischer-Tropsch fuel is definitely on the brown path." But the Energy Department sees potential. In March, the Energy Secretary, Samuel K. Bodman, said in a speech that making diesel fuel or jet fuel from coal was "one of the most exciting areas" of research and could be crucial to the President's goal of cutting oil imports. He said that loan guarantees enacted in last summer's energy bill might be used for Fischer-Tropsch diesel fuel. In Des Plaines, Ill., near Chicago, a new company called GreatPoint Energy has developed, on a laboratory scale, a vastly improved process for turning coal into natural gas. The promise and the pitfalls are similar for both GreatPoint and Rentech. Measured in the standard energy unit of a million British thermal units, or B.T.U. 's, coal sells for $1 or so, natural gas around $7. Diesel fuel is around $23. As with all energy conversions, turning coal into natural gas or diesel fuel means losing something in translation — specifically, energy — but if the price difference is big enough, the energy loss is not something that investors will worry about. But it also means carbon emissions, which causes concern to environmentalists. Carbon is released in converting coal into an energy-rich gas made up of carbon monoxide and hydrogen, and then converting the gas into something more useful. Rentech wants to turn it into liquid fuel. GreatPoint wants to rearrange the molecules into natural gas. But coal is cheap and the energy possibilities are endless. For example, at the Rentech plant, a substation on the east side of the plant that currently pulls in electricity will send it out instead. And, uniquely in this country, the plant will take coal and produce diesel fuel, which sells for more than $100 a barrel. The cost to convert the coal is $25 a barrel, the company says, a price that oil seems unlikely to fall to in the near future. So Rentech is discussing a second plant in Natchez, Miss., and participating in a third proposed project in Carbon County in Wyoming. The plant here will "bring back an industry that's shutting down," Hunt Ramsbottom, the company chairman, said of the fertilizer business. "The goal is fuels, but to get the plant up and running, fertilizer is a good backstop." And it is all local. The coal will come from southern Illinois, by barge or rail. The diesel can go straight to terminals or truckstops in the area, said Mr. Diesch, the plant manager, and the fertilizer to local farms. An odd advantage is that today, most coal-burning power plants in the area use coal hauled from Wyoming, because its sulfur content is lower; burning high-sulfur coal encourages acid rain. But if the coal is gasified, rather than burned, filtering out the sulfur is relatively easy, and the sulfur changes from a pollutant to a salable product. Emissions of traditional pollutants — that is, the ones the government regulates, and not carbon dioxide — will be lower with coal than they were with natural gas, he said. Outsiders are interested, but skeptical, because of the carbon problem. "It might serve our goals in terms of reducing oil dependence," said Phil Sharp, a former congressman from Indiana and now head of Resources for the Future, a nonprofit research organization in Washington. But "they should take into account that we are headed to a carbon-constrained economy." Robert Williams, a senior research scientist at Princeton, said "it's a step backward" to operate a plant like Rentech's without capturing the carbon. "It almost doubles the emission rate," he said. Mr. Ramsbottom also sees the carbon dioxide problem. "The worldwide production of Fischer-Tropsch fuels is going to ramp up dramatically, and carbon sequestration is on everybody's mind," he said. But the geology of this part of Illinois is not suitable for sequestering the carbon dioxide from these plants. Building a pipeline would be expensive and difficult to justify while carbon emissions are not taxed, experts say. GreatPoint has a different plan: move the plant where it can sell the carbon. Andrew Perlman, the company's chief executive, thinks it has value. "Not only is it capturable, one of biggest advantages of the system is, we can locate our plant near a natural gas pipeline, in places where we can sell that carbon dioxide for a profit, using existing technology," he said. Oil producers inject carbon dioxide into old oil fields, to force oil to the surface. Backers also hope that methanization, the process GreatPoint uses, will succeed in part because it fits in with existing energy infrastructures, like gas pipelines and coal mines. If it did, it could have a profound impact on the balance of natural gas imports, lessening or eliminating the need for liquefied natural gas ports. Like Fischer-Tropsch diesel, methanization is not a new idea; one plant in North Dakota does it now, using a technology paid for under the Carter-era Synthetic Fuels Corporation. But GreatPoint is going about it in a new way, in which far less energy is lost in the transition. There is a potential to make fuels from gasification better than ordinary fuels. Robert Williams, a senior research scientist at Princeton University, points out that crop wastes and wood chips can also be gasified, producing carbon monoxide and hydrogen. Normally, biomass is thought of as carbon-neutral, because for each plant cut down for gasification, another grows and absorbs carbon from the atmosphere. But if biomass is gasified and the carbon dioxide sequestered by being pumped into the ground in the expectation that it will stay there, then atmospheric carbon actually declines for every gallon produced. From a greenhouse perspective, that is more attractive than what Rentech does now with the carbon dioxide from its plant here. It is sold to soft-drink bottlers. That keeps the gas sequestered until someone burps. NOT long ago, I stood at the bottom of a strip mine in Wyoming and looked up at a 70-foot-high seam of coal. It had a brownish cast and crumbled when I touched it. I could see bits of woody fiber, the remains of a huge swamp that existed there 50 million years ago. I imagined this great coal seam rolling under the prairie for hundreds of miles. "We're the OPEC of coal," the head of a coal industry trade group told me later. During World War II, the Nazis, who were desperate to find a way to power their tanks with coal, pursued technology to transform coal into liquid fuels. In South Africa today, one energy company, Sasol, produces about 150,000 barrels a day of diesel from coal. We could do far better in the United States. According to a recent report by the National Coal Council, an advisory board to the Department of Energy that is dominated by coal executives, if America invested $211 billion in coal-to-liquids refineries over the next 20 years, we could make 2.6 million barrels of diesel per day, enhancing the American oil supply by 10 percent. A number of coal-to-liquids plants are on the drawing boards in the United States, and China is eagerly pursuing this technology too. Put aside the question of whether raising fuel efficiency standards for vehicles could achieve the same goal at far less cost. Instead, let's consider the wisdom of substituting one fossil fuel for another. We already burn a billion tons of coal a year — it generates more than half the electricity in the United States. But thanks in part to ever bigger, more powerful equipment, mining is destroying vast swaths of Appalachia while providing fewer well-paying jobs. From 1984 to 2004, the average coal miner's per-shift productivity more than doubled, while wages declined by 20 percent (adjusted for inflation). If we simply increase consumption, we will be condemning large areas of the country, including eastern Kentucky and southern West Virginia, to national sacrifice zones. In addition, coal-to-liquids plants consume enormous quantities of water — three barrels, on average, for every barrel of fuel produced. In many places, especially the coal-rich but water-poor Western prairies, this is not a good deal. Then there's global warming. To avoid dangerous climate change, many scientists argue that we must cut greenhouse gas emissions by 50 percent to 70 percent by 2050. Coal, the most carbon-intensive fossil fuel, is responsible for nearly 40 percent of American emissions of carbon dioxide, the main greenhouse gas. Since 1990, carbon dioxide emissions from fossil-fuel power plants have increased by 27 percent, compared to 19 percent from all sources nationally. Coal-to-liquids plants will only accelerate this trend. Depending on the technology used, refining coal can release 50 percent to 100 percent more carbon dioxide than refining petroleum. In theory, carbon dioxide can be captured and sequestered underground in tapped-out oil fields or deep saline aquifers. But this method will work only in regions where the geology is suitable, and even there, good sequestration space is limited. Moreover, injecting carbon dioxide underground can set off earthquakes. And the gas (CO2) is an asphyxiant: we risk deadly accidents should the millions of tons we would need to bury escape their underground prisons. In 1986, at Lake Nyos in Cameroon, 300,000 tons of naturally occurring carbon dioxide that had been trapped in the lake suddenly rose to the surface and formed a misty cloud, suffocating 1,700 people. "You oppose converting a portion of United States coal reserves, the world’s largest, into transportation fuel because of alleged environmental effects. In fact, carbon dioxide emissions from vehicles powered with coal-derived fuel would be reduced when compared with gasoline over the same number of miles. In addition, the coal liquefaction process that gasifies coal in converting it to liquid fuel not only removes conventional pollutants but is also fully compatible with carbon-capture technology now being developed. Commercial-scale carbon-capture and storage technology is expected to become available within 10 years when the first fleet of domestic coal liquefaction facilities would begin operating, if we started today. You reject carbon sequestration as “hugely expensive,” but so, too, is the cost of continued overreliance on foreign sources to meet our nation’s domestic energy needs."